Don’t own a DVR? Never time-shifted a TV show? Then you’re now officially in the minority, according to Comcast. The end of traditional broadcast television is nigh. Cable giant Comcast just surveyed the viewing habits of 1,000 TV watchers across the U.S., not just their own customers. Among the answers, one statistic stands out: 62% of people questioned had time-shifted a TV show. That is, they watched it at some time other than when it was broadcast, either on demand or via digital video recorder. That may come as no surprise to many of us, but it is a major milestone in the changing landscape of television. Regular old broadcast-dependent viewers are now officially in the minority. Though 60% of us own a digital video recorder, according to the survey, that isn’t the only way to shift TV time. Set-top boxes and online TV do the same thing. Some 62% of responders said they’d used one of these solutions to move a TV show from its broadcast slot to one of their own choosing. Six out of 10 said they were time-shifting more than a year ago, and 84% say there were doing it more than three years ago. The bigger picture is this: The end of linear-programmed broadcast TV may be closer than you may think. As set-top boxes become the norm, followed swiftly by Internet-enabled TVs, the notion of a programmed suite of shows may lose favor with networks and advertisers. If two-thirds of Americans find time-shifting easy and convenient, then a fully on-demand schedule– with exceptions for live events like sports, of course–may work better for all concerned. Networks would simply promote the hottest new shows in the stable. The audience seems to want this, and it would allow for more precisely targeted ad placements. 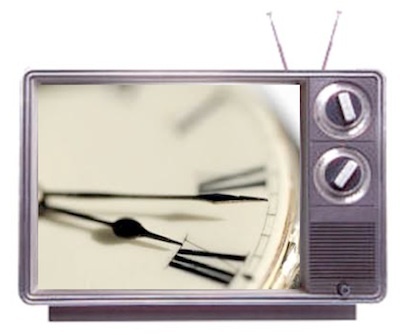 The ads could be sensitive to the time of day the show is eventually shown in a home. And TV Guide may have to scramble for a new strategy. Follow me, Kit Eaton, on Twitter.